Mimoco Release Jar Jar Binks for Real! No Joke! Looks like the staff over at Mimoco know a few more than just to make novelty USB flash drives. They also know have a sense of humor about things, and their latest USB flash drive release is a testament to that. Long known for their MIMOBOT collection, which has included Star Wars, My Little Pony, and G.I. Joe flash drive releases, Mimoco has decided to expand their Star Wars collection with an ultra-limited edition release of the infamous character: Jar Jar Binks. An April Fool’s joke in 2012, this time, MIMOBOT has made them FOR REAL! 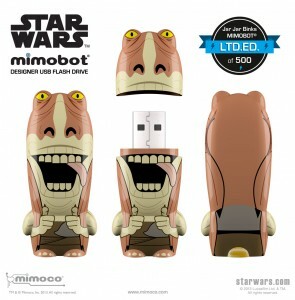 Star Wars fans will appreciate the irony of Mimoco’s release of a Jar Jar Binks USB flash drive. Of all the characters in the Star Wars universe, Jar Jar Binks has the worst memory. At least in this USB drive form of himself, he has the opportunity to possess a trait he wouldn’t have otherwise. The story of Jar Jar Bink’s flash drive release goes back to this same month, just a year earlier. Mimoco actually announced such a release, but the difference from this year is that then it was meant as an April Fool’s prank. Although when they found out it was all a joke, some people felt a bit more than just disappointment. To make good on its part, Mimoco decided that it was about time. And so, the Jar Jar Binks MIMOBOT. If you want to get your hands on this specific MIMOBOT, it pays to make your decision quickly. Mimoco only manufactured 500 hand-numbered Jar Jar Binks flash drives, a number that stays true to the definition of an ultra-limited edition release. The Binks USB flash drives come in five different memory storage capacities: 8 GB, 16 GB, 32 GB, 64 GB, and 128 GB. 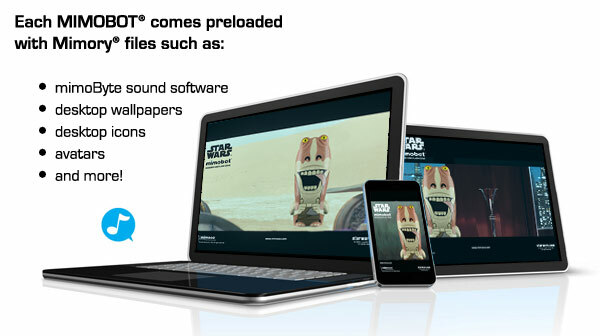 Each drive is loaded with some content sure to satisfy Star Wars fans, and more specifically Jar Jar Binks ones. Similar to previous releases, the drives are loaded with a MimoDesk personalization suite, comprised of Binks wallpapers, icons, and avatars, and MimoByte sound software. What’s particularly cool about the sound byte software is that it’s configured to play memorable Jar Jar Binks sounds and dialogue each time you plug in or eject the flash drive. Sure to bring fans a mix of fun and function, the Jar Jar Binks MIMOBOT can be ordered at Mimoco’s online store and in a few stores worldwide. Retail prices are as follows: $24.95 for 8 GB, $29.99 for 16 GB, $39.99 for 32 GB, $69.99 for 64 GB, and $129.99 for 128 GB. This entry was posted in Mimoco and tagged Custom Shaped USB, Jar Jar Binks, MIMOBOT, Mimoco, star wars, USB Flash Drive. Bookmark the permalink.